CBAZAAR is a free Windows 8 Shopping App that comes up with a wide range of the most stunning sarees, lehenga, salwars, men wear along with a decent range of matching accessories. 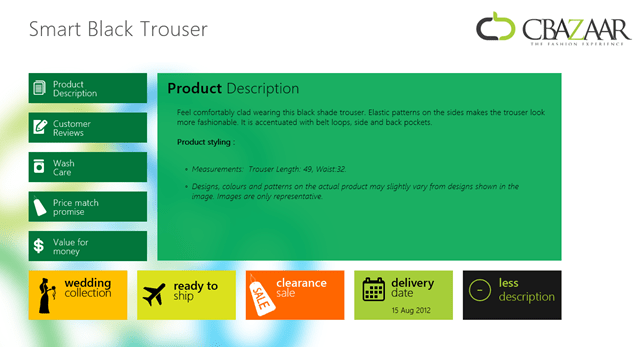 It is quite easy to browse the new fashion on this amazing Windows 8 shopping app. As simple as you do on an online purchasing site but now its more easy and you can ship your package in any part of the world. 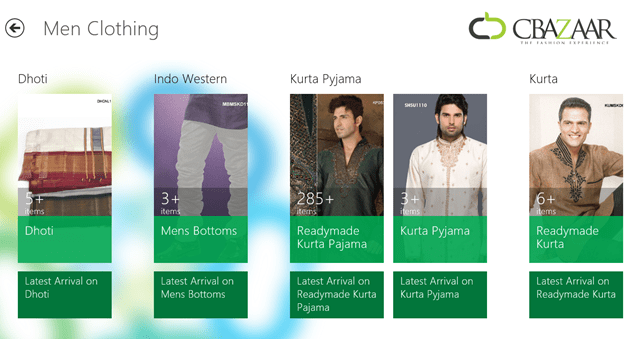 CBAZAAR Windows 8 app is just like hanging in a shopping mall with a wide collection of men, women & kids clothing also jewelry & handbags, the difference is now you don’t have to roam around for your favorite clothing line. You can easily shop for clothes according to the occasion, the type of fabric, the color and as the prime concern the amount you want to spend on that dress. Above, is the index page of this Windows 8 app where you can relish a number of features like you can check out what’s hot and what’s not, which dress is the most viewed or which is the best seller among them. Below, you can see men clothing section. Online shopping payment can be done in Indian currency as well as American Dollars. You can see a large range of clothing here and can select your favorite one and can checkout the description, price, fabric quality, color, its rating and other customer reviews. After selecting all those you want you can simply add them to your shopping cart. The best part is while shopping your favorite clothes, you can also select the matching jewelry and handbags and also other outfits which will suit you the best. And after, when you are done with all your shopping you can easily add it to your shopping cart or you can have it delivered later if you are seeking for an option, you can simply add it to your wish list and you are ready to go with it later. 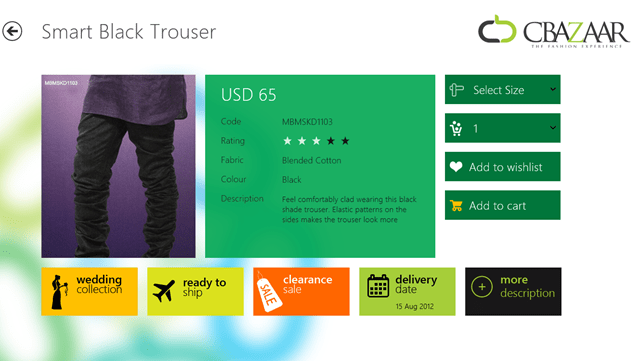 Also, check out our post on another Windows 8 Shopping App. 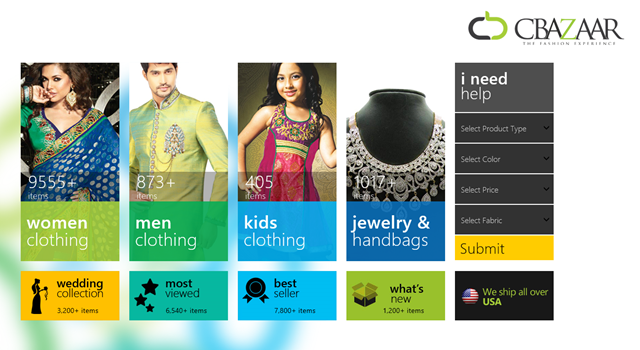 For all those fashion lovers, CBAZAAR is the best shopping app for Windows 8. Go ahead and install CBAZAAR available under the “Shopping” category of Windows 8.